Prang Sketcho oil pastels were hard for me to use. They are definitely for children. The picture on the cover of the box shows a stick held in the hand of a toddler -- accurate, because the one advantage these have for very small children is that the sticks are fat. Half an inch wide, 2 5/8" long, they are hard and waxy to the extreme. I had trouble even making a mark with some of the colors until I applied a lot of pressure and scraped a couple of times. The outside surface of these pastels dries out to where they skid over the paper. Until that's worn through it won't even make a mark. Then after that, it has a texture a lot more like a wax crayon than any other oil pastel I've tried. Prang Sketcho are harder than regular children's crayons. I compared them to the no-name ones in my granddaughter's art set and it took more pressure to get a mark. They crumble and get powdery at unpredictable moments. They are more transparent and at least some colors like the magenta, the purple and the light green look like fugitive fluorescents without the pigment concentration of Mungyo Gallery fluorescent colors. Why these were so much more costly per stick than better quality oil pastels, I can't begin to figure out unless it's the size of the sticks. Diameter encompasses more volume than area, so a stick twice as wide as a Pentel stick would actually have the volume of about four sticks. 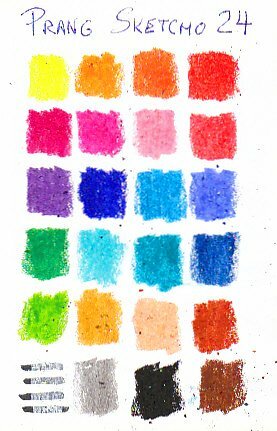 The price was close to $10 for a 24 color set, much higher per color than most of the low price oil pastels. They have that specific purpose. It's entirely possible my three year old grandson may handle Prang Sketcho easier than I do. He tends to press hard on things and bang them around, so the sticks may stand up to rough handling and be easier for him to hold and apply pressure to. The little guy is strong. I found out about their unfortunate texture while doing the color chart and tried to think of something interesting to draw with them that I could render well with very hard, transparent sticks. 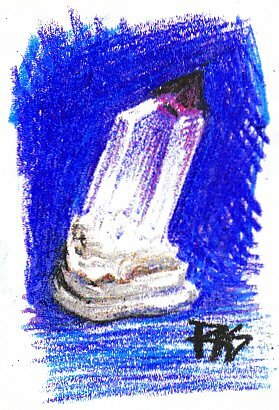 The result is a sketchy loose drawing of a clear amethyst crystal that I'd already done once in Holbeins on gray paper. An advantage of hard sticks is that very fine lines can be had using the edges, so I did a lot of linear work and crosshatching. The background I tried to blend over with three shades of blue once I'd hatched it in sufficiently. For blending, notice that the distinct marks of the Ultra Blue are still easily seen under the blending layer of Sky Blue. A light hand can result in some good broken-line effects while heavy pressure, enough to bend a Sennelier oil pastel and squash it over at an angle, will fill in an area with the type of patchy coverage you'd get with wax crayons. I did not like Prang Sketcho oil pastels. There are better firm brands for sketching, better translucent brands for layering, these are the most annoying oil pastels I've tested so far. I recommend them for artists four and under. Anyone older can probably find a better brand that's easier to handle. One thing about Prang Sketcho to remember. If these are the ones you started with and you're having trouble getting the effects you want, don't blame your techniques. Look for a set of Pentel or Loew-Cornell and find out what you can do with those if these tempt you to give up on the medium. Prang Sketcho are available at Blick Art Materials and other online art supply companies. This review is my personal opinion. If you disagree, please do contact me to describe your experience with Prang Sketcho oil pastels. I will be testing these for lightfastness in April 2009 along with all the other brands of oil pastels I'm reviewing. Till then I would assume these are probably as fugitive as kids' crayons -- something designed for very small children doesn't usually need to be archival as much as Non Toxic and not easily swallowed. That is one big advantage of these for the very young artist. My grandson could not get those sticks down his throat and choke, unlike smaller oil pastels. The full range of colors is 24, about all the very young artist wants to work with, the palette is suited to children too but does introduce them to red-brown and brown along with a peach color for light skin tones. Aha -- there on the package is one key phrase. They are Oil Pastel Crayons and that binder formula is more waxy than you'd expect from most oil pastels but not for crayons. Definitely nontoxic, I will not have a problem trusting my little grandson with them other than the possibility staining colors will get on the walls. They probably are the best brand for the little guy. Just not for me.